I can’t believe that I’ve only been in Jakarta for 2 days, if I’m to recount the places I’ve been to, done, and seen with the awesome girls of CS Jakarta. 2 months ago I was able to book a really cheap $10 return tickets to Jakarta with one of Cebu Pacific Air’s anniversary promotions. Beggars can’t be choosers (and I’m not complaining), my flight arrives at midnight. Yannie, Vivie and her mum came to the airport to fetch me on a car on loan from another friend of Yannie! 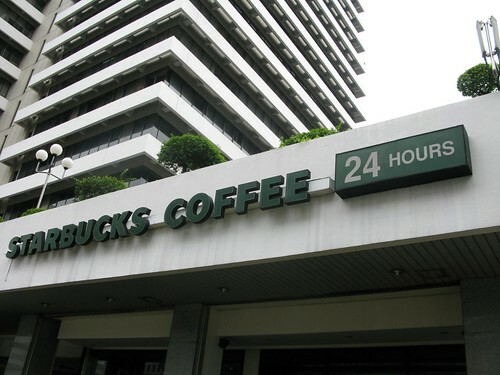 Their hospitality is the same brand as ours in the Philippines. Not surprisingly, I connected with them instantly and that Yannie (my host) and I chatted until wee hour in the morning. Not surprisingly, we didn’t wake up until 9am the next day. Vivie came for us an hour later and we set off for a full day ahead (i had no idea), but of course, not without stopping at Starbucks for our caffaine fix first! Coffee to go because 2 CSrs were already waiting for us at the Monas a.k.a National Monument a.k.a the president’s erection. 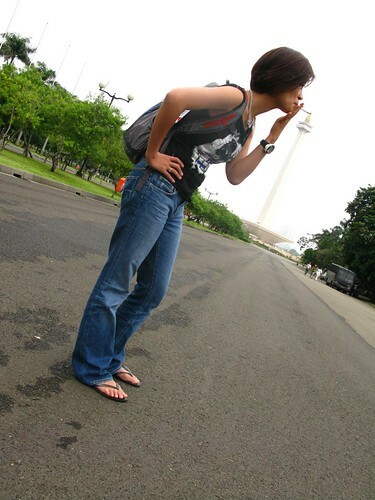 The 137-meter tall marble obelisk is the highest and most popular structure in Jakarta. This is the city’s symbol of freedom. It is possible to take a lift to the observation deck to view the city below, but the line is long takes more than 2 hours to wait. So we just took some creative shots with the monument. Finally around noon time we met up with the other cs Kim, Cicak, and Roman. But no time to eat lunch because we were to hit several museums and it being Saturday, they closes early. 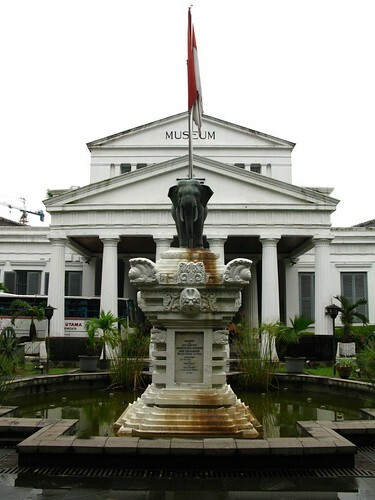 First stop: The National Museum is situated on Merdeka Barat Street. It houses huge collection of pre-historic, archelogical, and historical relics. Unfortunately we only had 20 minutes to roam around before it closes, so only had time to see the stone relics displayed at the first level. They were quite interesting pieces of artifacts from different era and area. 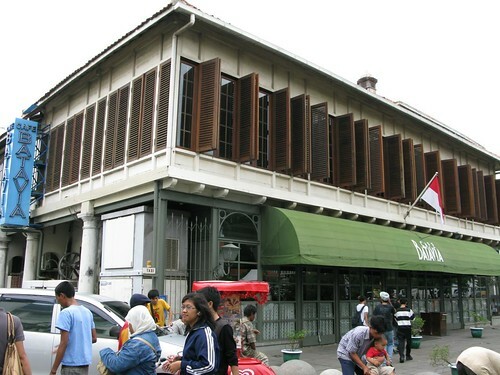 The Fatahillah Museum, also known as the Museum of Old Batavia located at the old town Kota Tua. 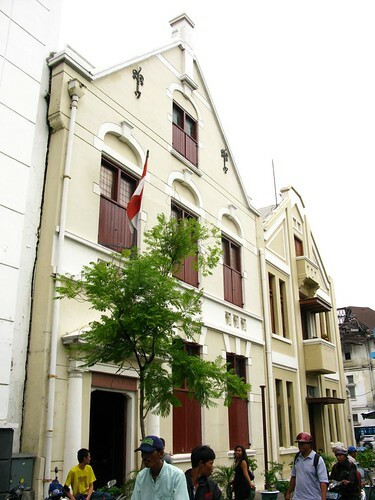 The structure of Dutch architecture and built in 1710 was used for administration and judicial purposes. Inside the multi-room building displays paintings and old furnitures preserved from the 18th century. In the backyard, weapons and artifacts are exhibited. And under the house are cells used as prisons. 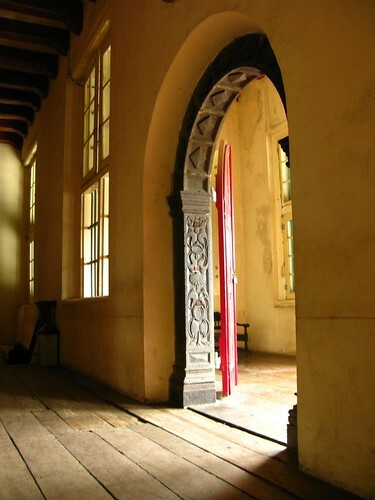 The artistic building around the corner was originally built as a church in 1640. 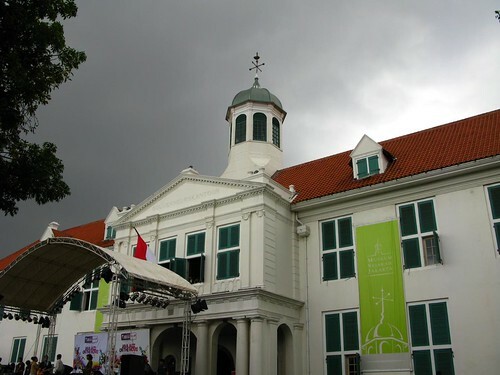 The structure has undergone several transformation and renovation, and has been used for different purposes until its inauguration as Shadow Puppet Museum in 1975. 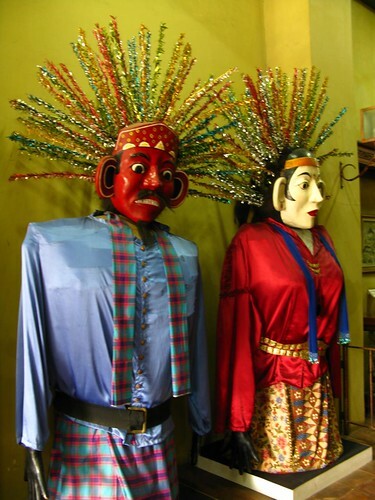 It has a collection of approximately 5.500 puppets and dolls from different parts of Indonesia and of the world. Now, while I find it lovely and interesting, I wouldn’t want to be locked inside the building after dark. At 3 o’clock, the museum tour ended. 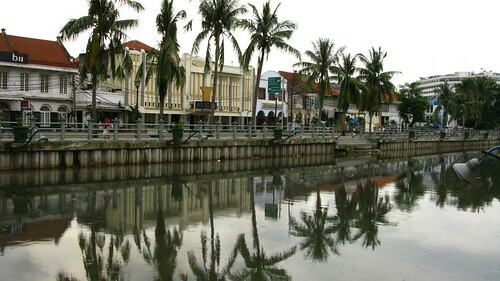 The quaint old town of Kota Tua that has many important historical sites around. It is touristic but also has many locals, I’m not sure why. But how cool that the wifi is free in this area? 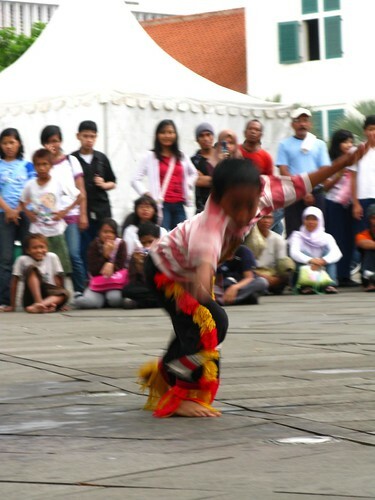 There was a concert going on at the square and also a street performance by eastern Javanese called the Horse Dancing, no horse around. Off the side of this square is a canal with Dutch style buildings backdrop that look very much like Amsterdam. After the photo session, everyone agreed that we will die if we don’t eat something soon. And we ate from one of these colorful hawker food stall. 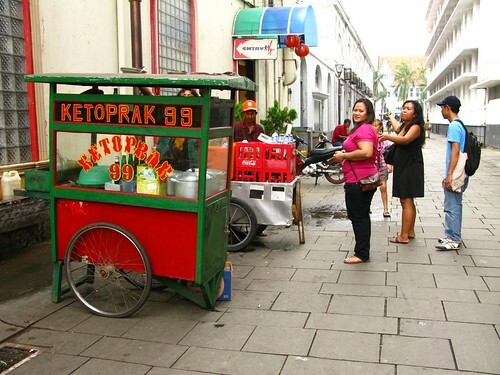 They warned me that some foreigners would get sick from these street food, I reminded them that I’m southeast asian. Cicak and Roman had to leave, and the remaining of us went back to Sarina to meet up with Hellen. This is where we grabbed Starbucks earlier, so this time we went next door to Miko Coffee Belgium. 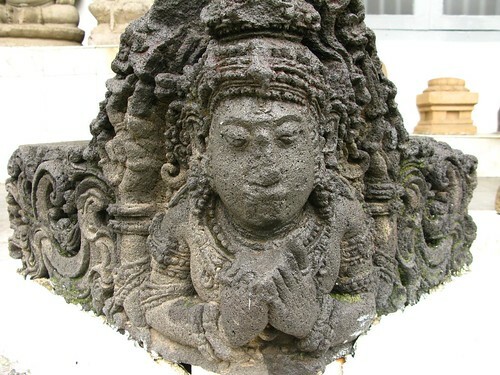 Hellen and I have corresponded at the SEA group about Indonesia travel. I think my trip’s itinerary is all based on her suggested route. We sat and chatted like old friends. 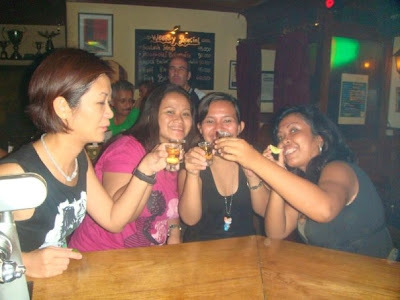 This scene could be a typical Saturday with friends in Manila. After coffee, it’s Kim’s turn to go and 4 of us girls were off to Planet Hollywood and met up with another CS girl, Indah. By now I feel a little bit like a bus driver picking and dropping people along the way. lol. We grabbed a quick bite for we were catching a movie in an hour. It was a dance movie called Make It Happen, starring some unfamiliar actors and actresses which turned out to be okay. It’s a movie similar to Julia Stile’s Save the Last Dance. So, guess where we went back to for karaoke, yes, Sarina’s. This is probably the Greenbelt in Indonesia. Seems that everyone had the same idea for Saturday night. We had to wait for almost an hour for a room. The karaoke system here is great, but then again, I’ve not been in karaoke in Manila for a while. The last time I went, we had like a VGA screen menu and a remote control with (A) and (B) buttons. This one has a PC and keyboard that you type in the title of the song. 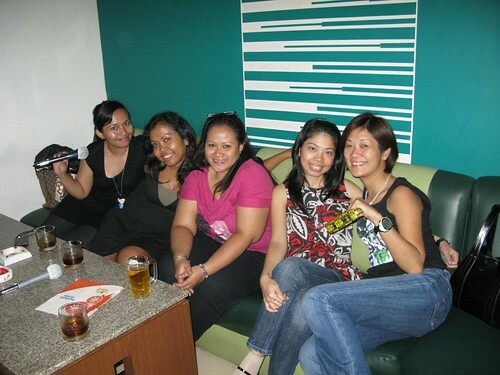 Anyway, these girls sang as well as my Manila friends and even chose songs like Dancing Queen and YMCA. The remaining four of us went to the car and Vivie started driving, they asked me, so Lil, what do you have in mind? In my mind I said, “seriously?” Lol. Do you prefer to watch a live band or just sit and drink. I chose the later, naturalement. Perhaps perked by the coffee she just had at Dunkin Donut, Vivie missed a U-turn and ran a red light , and at 1 in the morning, still got caught! We were hailed and stopped by the POLISI. I sat behind Vivie and curiously observing how this goes. The police seems friendly and smiling. Vivie was laughing and talking which I later found that they were speaking in Javanese, because they were both from East Java. Vivie was telling him that we just came from karaoke and that we spent all our money. Then Yannie asked Indah for 20.000, and Vivie handed it to the police, who then let us go. Twin City. We went to an English pub called Eastern Promis. It’s a nice place with good dance music and so we drink and dance the night (or morning) away. I just have to note that drinking is very expensive in Indonesia. And finally, the day ended at 4.30am. Surprise, surprise. We were dead until about noon Sunday. I woke and fell back to sleep a few times. So did the 2 girls. Indah slept over at Yannie’s too. We lay there and alternately use the computer, watch dvd, sleep inside the room. About 3pm we finally hauled our asses and ate something. Yannie cooked some delicious Indonesian thingy. Yum! Then we fell back to the earlier activities of bumming until about 8pm when we met up with Vivie and went to a pricey sports bar called Aphrodite. The girls wanted to play billards (pool) and they wanted me to teach them. Ha! Ha! I wasn’t good even during the time I was playing it almost everyday. We thought we could play there at the sports bar but turned out, you have to enlist and then when your name comes up, you challenge the winner of the previous game. Oh, no, no!